California’s Folsom Prison is one of the most well-known institutions in the world - launched into notoriety with a song written and performed by country legend Johnny Cash. Johnny Cash fans worldwide know every lyric to Folsom Prison Blues, the anthem that put the prison and the City of Folsom on the map. But only the most dedicated of Cash fans know the lyrics and story of a second song that pays homage to this famous institution: Greystone Chapel. When Folsom Prison was built in 1880, the original blueprints did not include a chapel. It would be another ten years before Folsom’s chapel was constructed out of several-hundred pound, hand-cut granite stones installed by Chinese laborers. Greystone Chapel was designed in the Gothic style by Protestant prison officials. Construction was completed on the one-room chapel in October, 1903. In its early years, the chapel primarily served Catholic religious activities. In 1909, however, it also began functioning as a theater for the prison’s movie showings. The theater would later become the sight of a breathtaking, 21-foot by 21-foot mural replica of Da Vinci's Last Supper, created by inmate #21692, Ralph Dubose Pekor. Pekor was art director, political cartoonist, and Hollywood set designer until he was found guilty of manslaughter and sentenced to 15 years at Folsom Prison. Pekor created multiple works of art while at Folsom Prison, but his masterpiece was - and still remains - the Last Supper. The mural took Pekor two years to complete, from 1938 - 1940. With little money, Pekor was forced to dye his own paints and even used other materials, such as coffee, to complete the mural. It’s rumored that Pekor used his own face for Jesus, and modeled the twelve disciples after fellow inmates. Greystone Chapel is a special place within Folsom Prison. The Chapel is open to all inmates, tended by volunteers, and informally governed by inmates who have committed themselves to a chapel life of redemption and renewal. Inmates who have broken ranks with prison gang affiliations come together and create new bonds in a new community dedicated to spiritual development. For those authentically inspired to a life of renewal, this commitment is honored and respected by fellow inmates, many of whom will attend baptisms and other religious rites as a share of support. That doesn’t mean the Chapel hasn’t seen it’s share of prison violence, but for the most part, it is a welcome reprieve from the grim and often violent reality of the prison for inmates truly seeking redemption. The story of Greystone Chapel itself is one of hard work and hope, but Greystone Chapel (the song) has a history filled with more twists, turns, redemption, hope, violence, and controversy than even the building itself. On January 13th, 1968, Johnny Cash performed in front of a live audience of prison inmates and guards at Folsom Prison. The performance was recorded and the album, At Folsom Prison, would be released four months later. The day before Johnny Cash was to take the prison stage, he was handed a cassette tape by Reverend Floyd Gressett, a Ventura pastor and prison minister. The tape was a recording of a song written and performed by inmate Glen Sherley about Folsom’s chapel. Unbeknownst to Sherley, Cash was so taken with the song that he stayed up all night learning it. The following day, Sherley was sitting in the second row as Johnny Cash, his band, the Tennessee Three, June Cash, and fellow performers Carl Perkins and the Statler Brothers took to the stage for that now-legendary prison performance. Needless to say, the audience of inmates erupted in exhilaration when Cash pointed out their fellow inmate and performed Sherley’s song: Greystone Chapel. Greystone Chapel and Cash’s dedication made it onto the album, Live at Folsom. The album is credited with reviving Cash’s career and being instrumental in his success. Sherley was also catapulted into his own minor musical success, even though he was still serving time in prison for robbery. After Cash, musician Eddy Arnold recorded one of Sherley’s songs. In 1971, Cash helped Sherley perform and record his own live album, this time from a prison hospital unit in Vacaville. Cash brought in session musicians from Nashville and supervised production of the album Glen Sherley - Live at Vacaville, California. Cash’s support for the prisoner didn’t stop there. Johnny Cash convinced then governor of California, Ronald Reagan, to permit an early release for Glen Sherley. 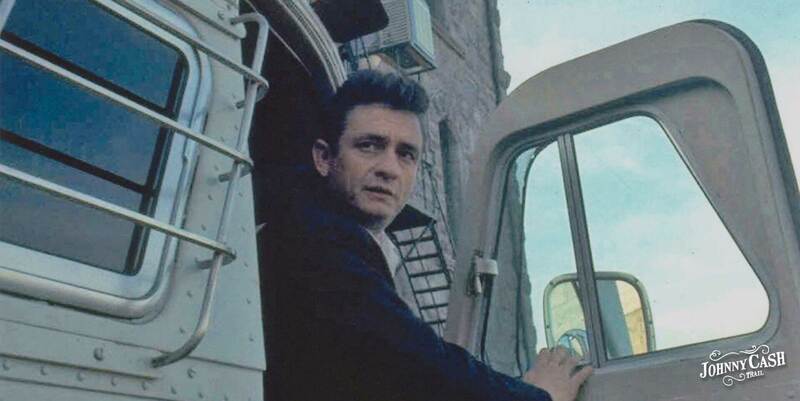 When he was released from prison in 1971, Cash himself was waiting for Sherley at the prison gates. Less than a week after his release, Cash asked Sherley to accompany him to a senate hearing on prison reform. Cash guided Sherley into the Nashville music scene, and the two men became friends; The Man in Black even hosted Sherley’s wedding at his home in Tennessee, and served as best man during the ceremony. By all measures, Sherley was the living embodiment of Cash’s belief in the power of prisoner reform. But Sherley struggled to leave his violent past behind him, even with the support and guidance of Johnny Cash. Sherley fell under the trappings of drugs and alcohol, and began to make violent threats to members of Cash’s crew while on tour. Cash became concerned about Sherley’s threats of violence, and eventually dismissed the former prisoner from his show. Sherley struggled out of the limelight, becoming estranged from his wife and kids and eventually finding work on a cattle farm. He succumbed to addiction, and in 1978 he shot a man in California while high on drugs. Sherley went into hiding, and two days later took his own life. Johnny Cash paid for the funeral expenses for his old friend, and Sherley was laid to rest in Salinas, CA. His death weighed heavily on Cash, who had earnestly believed that the former inmate would eventually find true redemption and turn his life around. Sherley’s death marked the end of Cash’s crusade for prison reform, and the Man in Black never again performed in front of a prison audience. The story of Glen Sherley and Greystone Chapel may not be well-known, but it is an integral part of Johnny Cash’s history - weaving together both highs and lows of his storied career. Artist Adan Romo pays tribute to this tale of redemption and loss with an art piece inspired by Folsom’s Chapel. The sculpture will be featured on the Johnny Cash Trail, paying homage to the impact the Man in Black had on the prisoners who were touched by his performance and crusade for reform. The Greystone Chapel sculpture is made from the very same, hand-cut stone granite blocks used to build Folsom Prison and its chapel. Inset in the blocks are metal plaques inscribed with passages from letters that inmates wrote to Johnny Cash in the years following his historic performance. The art of the Johnny Cash trail has been designed to pay tribute to the legacy of the Man in Black and the impact he had on the lives of those he touched. The Greystone Chapel sculpture is an important piece of the legacy, acknowledging a piece of Cash’s history that is both hopeful and sorrowful. Cash’s attempts at inmate reform may not have always been successful, but the letters are proof that Cash did make a positive impact on the prisoners inside Folsom’s walls. Greystone Chapel is a building and a song, but it’s also a story full of life and loss, music and friendship, hope, reform, and redemption. Much like the story of Johnny Cash himself.